BlackBerry has announced the launch of BBM for Windows Phone, and BlackBerry Messenger is now available in beta on Microsoft’s Windows Phone platform. 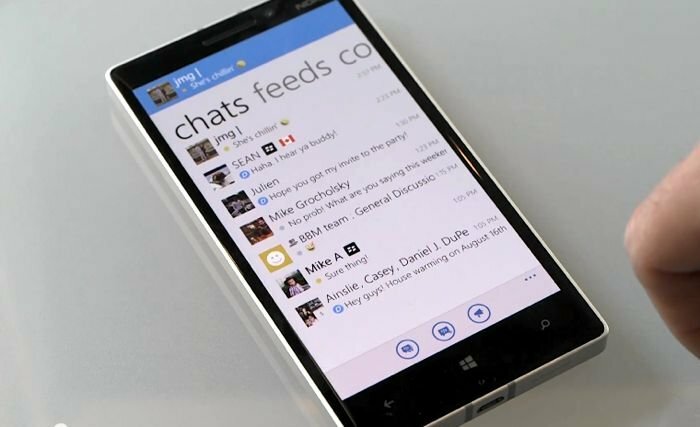 BBM for Windows Phone is now available to download from the Windows Phone Store, the app will work with both Windows Phone 8 and Windows Phone 8.1 devices. BBM brings you together in the moment with friends and family through instant chats, picture sharing, voice notes and more. Download the official version of BBM now to start chatting with other BBM users on Windows Phone, iPhone, Android and BlackBerry. Note on V1: We’re excited to offer BBM to Windows Phone users! V1 focuses on bringing the speed, privacy and security of BBM – loved by millions around the world – to chatting and sharing through 1:1, multiperson and BBM Group chats. We’re already working hard on V2 where we’ll introduce additional features to BBM for Windows Phone. You can download BBM for Windows Phone over at the Windows Phone Store, you can also find out more details about the app over at the BlackBerry Blog at the link below.